Facad® is a software program used for orthodontic tracing, cephalometric analysis, and visual diagnostic imaging, as well as for treatment planning with soft tissue profile prediction for both orthodontics and maxillo-facial surgery. This program is meant to be used by orthodontists and orthofacial surgeons. The software is developed by the Swedish company Ilexis AB, situated in Linköping, Sweden. Facad is a very powerful, flexible, and easy-to-use software that can be used both for tracing with cephalometric analysis, and for treatment simulation with soft tissue profile prediction. Read more about the functionality that is offered in the Facad software. We offer Facad in several packages and solutions, suitable for dental clinics of different sizes, ranging from small private to large public clinics, as well as educational organizations. Try before you buy using our free 30-day trial version. The software Facad runs on PC’s using Windows 10, Windows 8-8.1, and Windows 7, as well as several Windows Server OS when used in a terminal-server environment such as Citrix. Read what users think about the software Facad. Download the Facad brochure here, it is available in several languages. Facad is available in Danish, Dutch, English, Finnish, French, German, Italian, Norwegian, Polish, Portuguese, Slovenian, Spanish, and Swedish. Get your own tracing software. The Facad software was originally developed in co-operation with the maxillofacial unit at the University Hospital in Linköping, Sweden. Facad has been in clinical use for more than 20 years. Ilexis exhibits at Dental Days (Tandfaglige dage) on 4-5 April 2019 at Bella Center Copenhagen, Denmark. 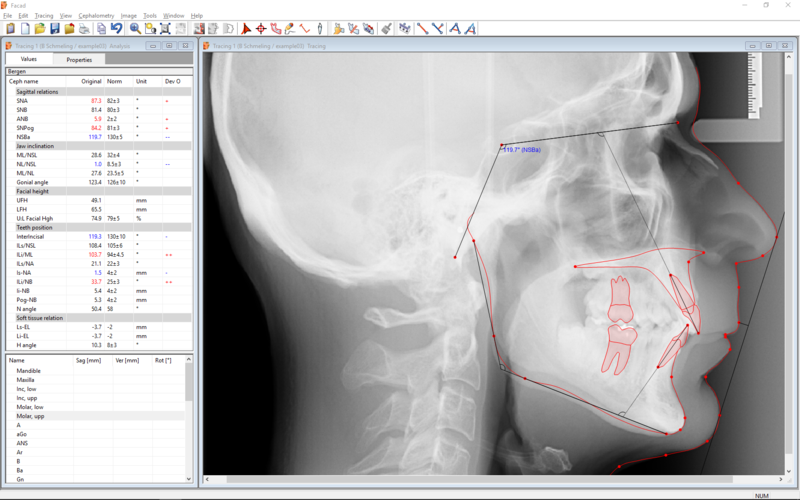 Facad is an orthodontic tracing software for cephalometric analysis and treatment planning used by orthodontists and orthofacial surgeons. The Facad software is CE marked according to the Directive 93/42/EEC on Medical Devices, annex II (MDD). Ilexis AB is since 2012 conforming to the requirements of SS-EN ISO 13485, i.e. our quality management system is designed to demonstrate our ability to provide medical devices and related services that consistently meet customer and applicable regulatory requirements.